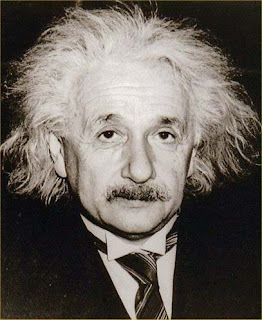 I've decided to take a little inspiration from good ole' Al here and not get my hair cut. My last trip to the barber was on my birthday, just two-weeks shy of it being four months now. I'm not sure why I originally decided to go without an appointment to go under the scissors, as we get deeper into My Own Financial Crisis it does save on the pocketbook, or should I say the grocery bill. When it comes to the sock thing, I'm sorry Al, but I have to wear them. One leather jacket is taken care of, I purchased one for $5 nine years ago from a vintage clothing store. Beat that Einstein! Although in your time it probably didn't cost much more. And I'm not going to argue with you about suspenders being superfluous, mainly because I don't own a pair of suspenders. The only problem thus far with my new locks: no longer can I roll out of bed and head out into the streets for some daily errands without donning a hat. Unless I want to sport the same 'do as Al there.